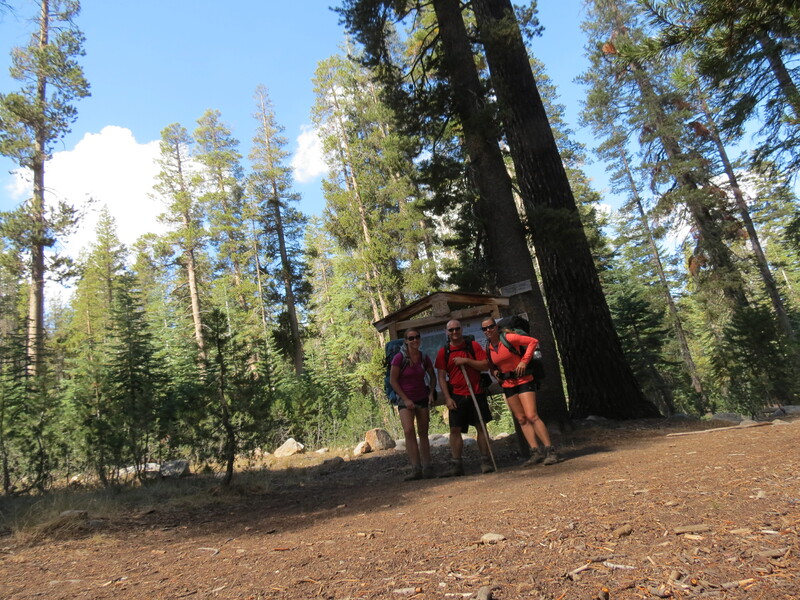 Dinkey Lakes Wilderness Area - Beyond Limits on Foot! To get to the trailhead: From the 99 take 180 East to 168 East for 50 miles to the town of Shaver Lake. Once you hit Dinkey Creek Road turn right and stay on here for 11.7 miles. Once you hit McKinley Grove Road turn right and drive another 8.4 miles. Continue straight onto Ross Crossing Road for .5 miles until you make a slight left onto McKinley Grove Road, continue straight on McKinley Grove Road for 4.7 miles. Make a left at Hall Meadow Lane and in .2 miles make slight right onto Courtwright Way. Stay on Courtwright Way for about 10 miles, you should pass Trapper Springs Campground and then look for a small dirt parking lot on the left, park here. The trailhead will be at the end of the parking lot. We recommend GPS and a map as the road signs are not obvious (driving at night especially). Permit: A permit is required to stay overnight in the Dinkey Lakes Wilderness Area. Campfires not allowed during the duration of our stay. Itinerary: Original path: not even close to what we actually did (that’s the beauty of this area, you can lake hop anyway which way you feel like). Day 1 (Cliff Lake Trailhead at Courwtright Reservoir to Little Lake), Day 2 (Little Lake to Island Lake, detour to Three Sisters back to Island Lake), Day 3 (Island Lake to Nelson Lake) & Day 4 (Nelson Lake to Cliff Lake Trailhead at Courwtright Resorvoir). We spent the night at Trapper Springs Campground before our start to Little Lake. Day 1: Elevation start (8400) at Cliff Lake Trailhead. There were only a handful of cars parked in the lot, so we knew we would have an enjoyable “quiet” time off-grid. Weight our packs before start with 2 liters of water, I was starting with 42 lbs. Our first sign of water was Courtwright Reservoir, which was obvious how low the water was. Quick picture and back to trail where we headed to find the first trail crossing about 2 miles in. Instead of any ascent at this point we had dropped down to 8190’. The goal was to cut through off trail and hit Helms Meadow. After a couple creek crossings, getting scratched up from fallen twigs and hitting gorgeous meadows along the way, we hit the trail, which led us to the meadow we were looking for (Helms). At this point of the trail we had a perfect view of Dogtooth Peak gnarling above us at 10256’. Little Lake was our destination which lies at the bottom of Dogtooth Peak. The trail seemed at times to disappear, but with the map in one hand and Dogtooth guiding us on our left, we were able to find the creek that would take us to Little Lake. Following this creek, climbing up 300 feet was quite strenuous as it was spent boulder hopping and climbing in the bed of the creek/waterfall; luckily there was not much water in our way. We hit the altitude of Little Lake and thought that the lake had been completely dried out until we decided to walk a bit further. Little Lake was definitely not dried out; its picturesque surroundings definitely made this an enjoyable spot to camp. We had not seen a soul at this lake. Day 2: After a morning swim and a quick bite we headed out on a shorter day. Destination would be Island Lake as one of us were extremely sick. We headed out to find the trail that would lead us to Island only to notice the more we climbed up, the more smoke we saw. It was easy to find the trail up to the next lake, Rock Lake, which is known to being close to the center of the Dinkey Lakes Wilderness. We ran into a group heading back to Courtwright and were able to grab extra teepee and Sudafed for our sick one. Rock Lake was quite gloomy because of the smoke and clouds settling in on it. We headed to the right to Second Dinkey Lake. This lake was quite nice to with a small trail keeping us close to its rim. Passing this small alpine lake we scrambled over some granite boulders and hit Island Lake. This lake is the highest of all the Dinkey Lakes. It is surrounded by mostly granite and a grassy area near the inlet. The view of Three Sisters Peak is there, but the weather didn’t seem to clear up for us to summit it. Instead we looked for a campsite to set up our tents. We passed by a couple campers tents who seemed to be out on their own and nowhere in sight. We found a perfect spot next to a boulder that would be our backrests for the rest of the day. After a quick snack, two of us headed to try and climb Three Sisters Peak. Daypack on our backs we decided to climb between the lower of the two peaks. This was definitely quite a scramble up, but when we finally made it to the top after passing by a pair of hikers poles, dropping rocks, climbing 3 to 4 foot boulders and taking breathers. The view from the middle peak was unbelievable since the sky had cleared up we had a 360 degree panorama of Dinkey and the vastness around it. If I remember correctly we could see at least 10 lakes from up there at 10343’. The way down was much easier once we were able to find a simpler way from the view we had. We reached back to camp and went to fish for a little, but absolutely no luck again. After dinner it got quite cold, so we warmed up with a little hot tea and watched the stars above us. Day 3: Another morning swim that we couldn’t resist. Goal was to find a lake close to the trailhead; no luck as the closest lake was still 7 miles away. Either way we headed back down passed Second Dinkey Lake, passed Rock Lake. Before heading down to Cliff Lake we decided to check out Bullfrog Lake, which was on the east side of Dogtooth Peak. From the Cliff Lake trailhead we descended to Bullfrog and its short cross country to this pretty little lake where we enjoyed the view of Dogtooth and the perfectly clear water while we munched on a small snack. After a good 30 minutes of rest, we had a bit of a climb ahead of us, but after most of the way was downhill. We passed a few people on our way down reaching Cliff Lake. Cliff Lake was fairly large and extremely popular for families as there seems to be a generous amount of camping spots around it. We were reluctant to stop here and decided to head on to get closer to the trailhead. After more downhill we reached an intersection. Here we could either go left back to Helms Meadow, right to Nelson Lake or straight and keep going back to Courtright. We put down our packs and went left to a small lake. It was picturesque, but definitely not the best place to camp as it was marshy and pumping water wouldn’t be the best spot. The lake was completely out in the open in a meadow. We headed back to our packs and after some rest we turned our trip towards Nelson Lake. There was not much uphill, but it was a good 3 miles until we reached the lake. There weren’t many campgrounds and the lake was a bit different that the others. After walking around through bushes and trees we found a spot that would work for a campsite. The lake was not as accessible as the small streams leading into it in the meadow area on the south side of the lake. This is where we pumped our water and hung around to watch the sunset behind the trees to the west. Day 4: No swim this morning just the hike back to the cars as it was time to go home. It was still another 7 miles mostly level except for the last mile or so was uphill, a wonderful way to finish a hike. Either way it didn’t take us long to get back to the cars and head into town for a well needed burger. We stopped in Shaver Lake at the Hungry Hut. The line was long, but the burger was well worth the way. I recommend stopping there for a burger. Note to self: Bring medicine in case you get sick! Yes, it was super cold. We didn’t stay in very long, but definitely nice and refreshing.